No time to drop off your parcel at our DHL ServicePoints? Simply create your shipment as well as schedule a courier pickup conveniently online. Wait! We have more to offer. Enjoy 20% off international shipments online when you pay with your credit card! Just enter the promo code ONLINE20 at checkout to redeem your savings! 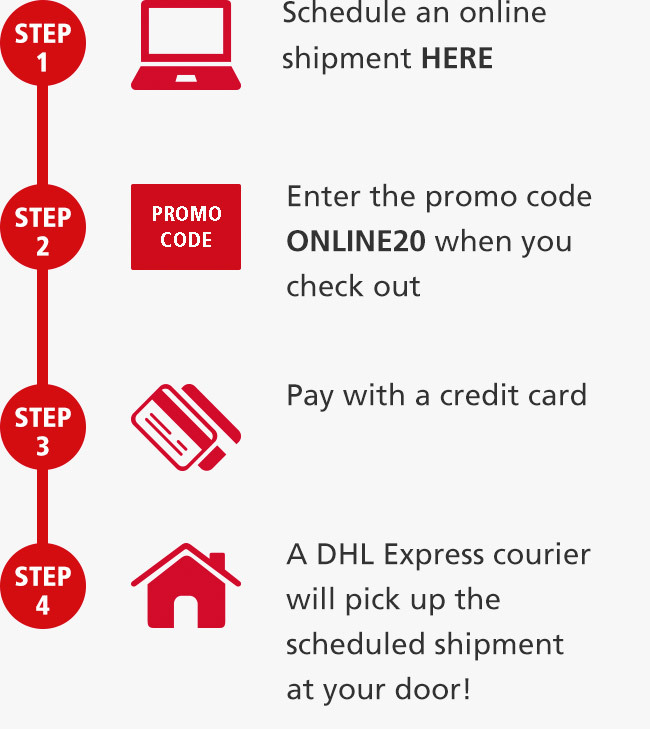 Click here for our guide on how to apply a promo code to your shipment order. Promotion ends 31 December 2019. For a user-friendly mobile experience, enable desktop view by selecting "Request desktop site" (for iOS users) and "Desktop site" (for Android users). Next, click "Ship" in the navigation menu and select “Create a Shipment”. Leveraging our global network of customs experts. Ships to and from 220 countries. Know where your package is at all times.